Many patients with CPAP systems find it difficult to travel with the necessary equipment. Frequent travelers often find themselves foregoing sleep apnea treatment altogether when they’re travelling. While this may not seem like a big deal, the cumulative effects of irregular sleep cycles can be detrimental to your health. Read on to learn more about how to travel with your CPAP system and sleep soundly anywhere you go. The number one recommendation from sleep doctors is that patients keep their CPAP systems with them when they travel. Tote your CPAP in your carry-on luggage, so you know you’ll have it when you land. You should also plan to buy your distilled water when you land, so take a few moments to look for a grocery store or pharmacy along the route from the airport to your final destination. Some hotels will also provide distilled water on request, so you may want to ask when you book your room. You may want to consider purchasing a travel-sized CPAP system. These can be a little pricey, but if you fly regularly, the investment will more than pay for itself. These smaller systems will fit in a travel bag, require less distilled water to operate correctly, and are often battery operated and do not need to be plugged in. This is great for sleep apnea sufferers who enjoy camping. If you travel internationally, your CPAP system should have automatic voltage adaptation. You’ll just need to invest in a set of adapters for the different types of plugs you’ll encounter abroad. You can also use a battery-operated travel CPAP to avoid the necessity to plug your CPAP in altogether. This may not seem like the most obvious stop when you’re looking for sleep apnea treatments, but your dentist can actually provide an effective alternative to CPAP therapy for many patients. 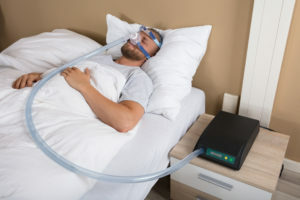 Sleep apnea appliances are treatments for patients who suffer from the obstructive type of sleep apnea. They shift the jaw forward and hold the airway open, so you can breathe deeply through the night. Some patients with severe sleep apnea are even able to use an oral appliance in conjunction with CPAP to improve their nighttime breathing. Then, you can bring along the small, portable appliance with you while traveling, allowing you to sleep and breathe deeply anywhere you go. At the Westfield dental office of David M. Weinman, DMD, we are happy to offer sleep apnea therapy using oral appliances that are convenient for travel and effective to improve quality and quantity of sleep for most obstructive sleep apnea sufferers. We also work closely with traditional sleep doctors to provide diagnosis and treatment planning including combined CPAP and oral appliance therapies. If you’re a frequent traveler who has been diagnosed with sleep apnea, call our office to schedule a consultation today. We may be able to help you sleep soundly through the night at home and away.